Jennifer DePerrio, 45, of Jefferson, laughed as she waited in line at the opening of Cultivate on Nov. 20. Customers spent more than $2 million on marijuana products during the first week of recreational sales in Massachusetts, according to data from the state Cannabis Control Commission. 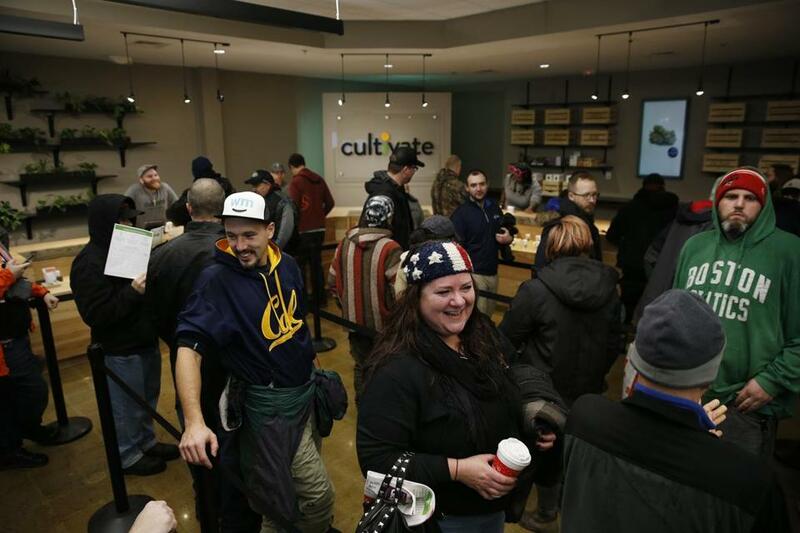 Cultivate in Leicester and New England Treatment Access in Northampton, the first two recreational pot shops on the East Coast, made a total of $2.2 million between Nov. 20 and Nov. 25. The data include sales for five days of business. Both stores were closed on Thanksgiving. Sales revenue was highest on the Friday after Thanksgiving, with customers at the two stores spending a total of nearly $480,000 on 12,199 items like packs of pre-rolled joints, bottles of marijuana concentrate, and chocolate bars. The stores sold the largest number of products Saturday — 12,593 products for about $468,000. Altogether, customers bought a total of 56,380 products over the course of the five days. On average, customers paid $39.33 per unit of each product purchased.